It’s dark, there is a bump in the night. You’re wondering if you were just dreaming, or if it’s time to protect your family. You’re groggy, tired and disoriented. You reach for your glasses, you suddenly hear something again. Your heart stops for a moment. Is this it? You place your fingers on the safe to unlock your personal protection pistol. You’re not sure it if it’s a neighborhood cat rubbing up against its reflection on your sliding glass door, or the people who have been invading homes in your area at an alarming rate. You are quiet, but in a panic, you wake up your significant other: “…where’s the flashlight?” you ask. They don’t know. What now? There’s a reason you need the best pistol light you can get. Don’t be unsure. Don’t be caught without the tactical advantage. Solve the obvious problems before they become problems. The pistol light has its place in the world of tactics and self-defense. For years the law enforcement community and top tier operators in military special forces around the world have advocated for pistol lights. Forget about the 2-hand hold that requires a flashlight and a firearm. Forget about the adjustment to the light that full room lighting can cause. With the best pistol light, you’re going to be able to identify threats or the lack of a threat quickly and easily. You’ll be able to act quicker and perhaps it could save your life with the time it saves and the utility it offers. 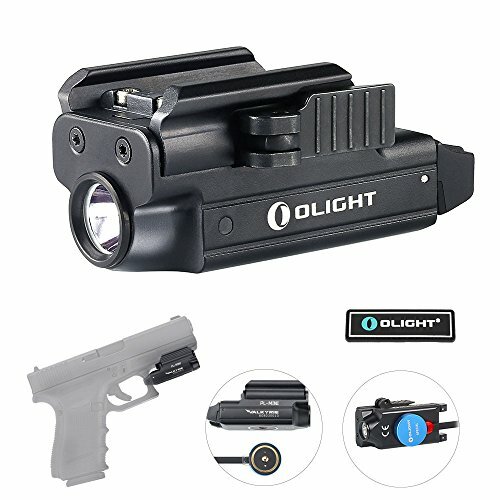 Below is a list with every excellent pistol flashlight available to the mainstream community and a review on each light’s unique capabilities and utility. We’ve also included a bit of information to give you a solid foundation to help you decide which light attributes and characteristics make the most sense and how to pick a winning pistol light. Do I need a flashlight on my pistol? The short answer is yes. Because thieves in the night; gangbangers that want to hurt you in the alleyway outside your apartment, and low life’s that would just as soon see you in the ditch while taking the cash out of your wallet as hold a respectable job, they don’t count on being outed to the light. They work in the shadows. They rely on dark alleyways, and the middle of the night to hold a knife against your back or invade your home. Pistol lights are preemptive; they are helpful in deterring threats before the threat is too great to handle. The preparation of using a pistol light puts you in a ready state and helps you to make an informed decision about what the actual threat is and what level of threat it offers. Long story short, for the inexpensive cost of a top tier pistol light, you can ensure you never get put in a position where the shadows can rule the night, and you don’t get a say. The price of tactical pistol mounted flashlights has come way down, due to their proliferation and the improvement of technology in the lighting space including LED technology; high grade polymers and easy access to aircraft grade aluminum. Not to mention the heavy increase in personal defense consumers of late. They know that they would rather be in control of their potential to become a victim, instead of leaving it to chance and some bad actors that aren’t able to distinguish the importance of human life whether it is because of drugs, influence of others; sociopathy or psychopathy. Do you need a pistol flashlight? Yes. Because if you don’t have one you’ve saved a paltry sum of money and you won’t have any help in identifying and acting on potential threats when you need it the most. You don’t have to, but with the prices that these spectacular lights have, it’s almost foolish not to entertain the idea. After all, the low weight, long life and durable build qualities of these top tier lights means you have very little to worry about in protecting your investment. There are a few things that will help you determine the best pistol light. These are the quick, down and dirty aspects of picking a light for your handgun that make sense to consider. There are plenty of complicated definitions of what a lumen is, but that’s not helpful here. The basics are as follows: the higher the lumen count, the brighter the perceived light on target and in the surrounding area. Lumens are often misreported and lied about by manufacturers. About 300 lumens is enough if shined directly in the eyes of another human being to temporarily blind them in a dark room. You can do it with less, but the 300 lumen threshold is effective for a few seconds at least, especially when in a dark room. The lumen counts on this list of products are generally considered to be accurate. Either this is by research proven to be true in comparative tests to other lights, or they are stated by reputable brands that make the lights. Lumens aren’t generally a thing affected by price too much. That is on the low end of the numbers anyway. That is to say: even a cheap light can boast impressive lumens and be accurate, but the cost isn’t exponentially higher to get a lumen count that is comparable to others in the class or lights. That said: to get super lofty lumen counts, you can expect to pay a price premium (generally for lumen counts significantly above 600 lumens). Throw is the distance that a light can remain focused to provide a spotlight-like effect on target. Flood is the amount of light that can leak out into the immediate area to illuminate a broader angle of the area. Sometimes you want heavy throw (when you want to illuminate something far away) and sometimes you want heavy flood (when you are in a small room and need to see all the corners at one glance). 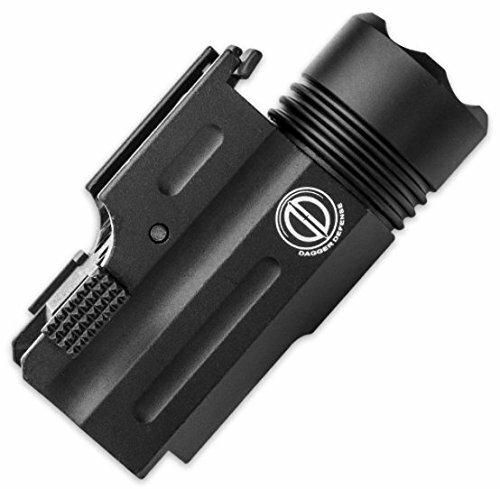 The best pistol light will be a hybrid usually, with the ability to illuminate to intermediate distances, but also to illuminate enough of the immediate area for safety reasons. MOST lights choose one or the other; pistol flashlights generally operate as a hybrid model because they are used in varied use cases and many different scenarios. Each gun has their own potential for mounting options. There are a few standards, but no light is 100% versatile and usable across the entire spectrum of mounts and rails, without at least an adapter. Lucky for consumers who want ease of implementation, most gun lights come with adaptors or are built to the specific guns they own and fit easily. Worst case scenario, almost ALL models available can accept an adaptor of universal capability to mate to a specific firearm. You will need to know what kind of mount you need and match it to the light. You can usually find this information in your firearm’s owner’s manual. If you cannot, you can ask a gun expert or do a few searches online to make sure that you have the correct information. Different lights use different batteries. Not all batteries are created equal. Some lights use really good batteries, some don’t. And this isn’t just a matter of Duracell versus Energizer. Sometimes the batteries are totally different platforms and sizes. Most of the items on this list use high quality batteries and last a decent amount of run time to keep you out of danger. Most pistol lights run off some iteration of the powerful CR123A battery. Some on this list opt for an internal proprietary battery to run the lights, but they are top quality iterations. Some others may require CR1/3N Lithium cells or CR2 lithium cells. All of these are potent cells for these types of devices and will serve you well. If you are using a light not on this list and it asks for consumer grade cells, then question the longevity of the unit and the light output. Admittedly, the Dagger Defense DD-SD01 is the cheapest on the list, and it isn’t of particularly high quality, but it serves a purpose and it is able to be used without any excuses due to price point. It wont last for many years and it doesn’t boast proven results or high performance. What it does do and does it well: it inexpensively shines light onto targets and helps you assess threats with more data. WHY IT IS RECOMMENDED: The Dagger Defense DD-SD01 is cheap and it does meet the minimum expectation/specification of lighting up a room adequately enough to identify risks/threats. This is a nice light for the money and offers an easy to mount snap on interface as well as a high lumen count of 800 lumens. The range of weapons it fits is excellent. The durability and quality of manufacture is very high. 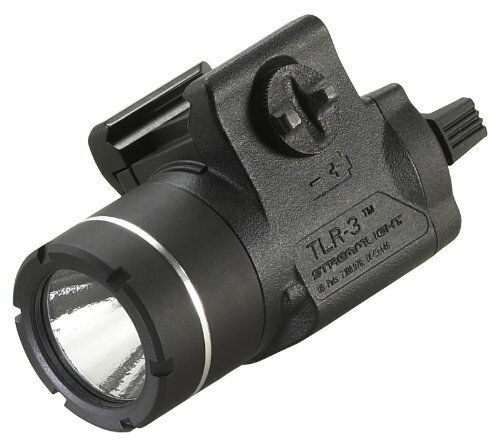 The TLR-1 HL features a c4 LED and uses a couple of CR123 3-volt battery cells which offer excellent run time of 1.75 hours with a high throw beam focal point. The hybridized beam and reflector offer sufficient light in smaller spaces too, with the beneficial light bleed. 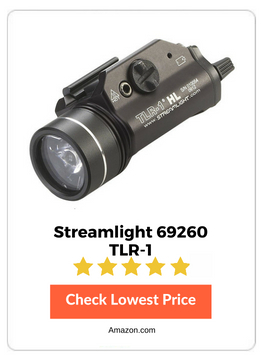 WHY IT IS RECOMMENDED: Streamlight makes top quality products and they have this segment of the market well covered with top tier products in general. Compact and lightweight, width and length perfect for compact making it easily concealable. 260mAh built-in lithium polymer battery pushing a maximum output of 400 lumens. Incorporates the OLIGHT signature magnetic charging system for maximum convenience. Manual quick attach and release mounting system. Low power warning indicator. Hit the switch downward to turn on minimizing accidental triggering when put into a holster. Output modes: momentary-on, constant on. Olight is famous for making incredibly high quality, intuitive products in the mainstream flashlight market. Their general approach is towards over engineering and making very durable products. This light is not an exception. The low price and high-quality build and a potent rechargeable internal battery and a very acceptable 400 lumen brightness as well as a 5 year warranty makes this a legitimate option. WHY IT IS RECOMMENDED: An easily rechargeable battery pack and a solid 400 lumen output, this is a powerhouse piece with a very nice build from Olight. The 75-meter throw distance makes this a very good hybrid light, which is suitable in short hallways as well as long alleyways. Yes, it’s not the brightest light ever, and it’s focused on cutting costs to meet a price point, but the Streamlight 69220 is still better than anything else in its price class from lesser makers. It offers 1.5 hours of run time and has impressive waterproofness as well as a decent battery source. The mount fits Glocks or standard picatinny rails making it quite versatile. The other mounts available can be had inexpensively. A fantastic mix of flood and throw make this a good all-purpose weapon light despite the lower lumen count. 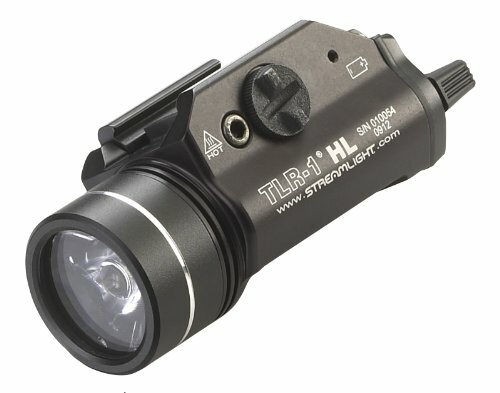 Not the finest option from Streamlight despite good entry level and compact performance. WHY IT IS RECOMMENDED: Simple, with a robust mount offering and a nice quality built. 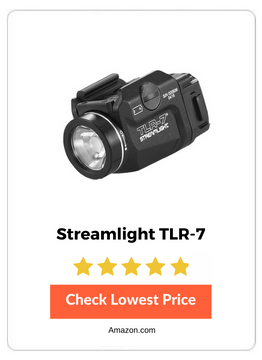 This is a legitimate bargain offering from Streamlight, a leader in this market segment. 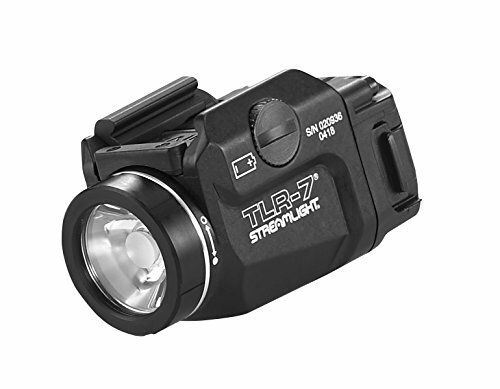 The Streamlight TLR-6 is only 100 lumens and that hurts a little. It won’t provide blinding light for you to disorient intruders, but it will be easier for your eyes to adjust to and the battery life will be better compared to heavy drain LED’s. The dual light and laser combination for Glock pistols only, offers some additional considerations for hitting what you are aiming at. This is an impressive light/laser combination for the price point. WHY IT IS RECOMMENDED: A quality build and while it isn’t the most powerful option light wise, this is a nice combination device for the Glock pistol range. A Streamlight light/laser combination is always a good option. 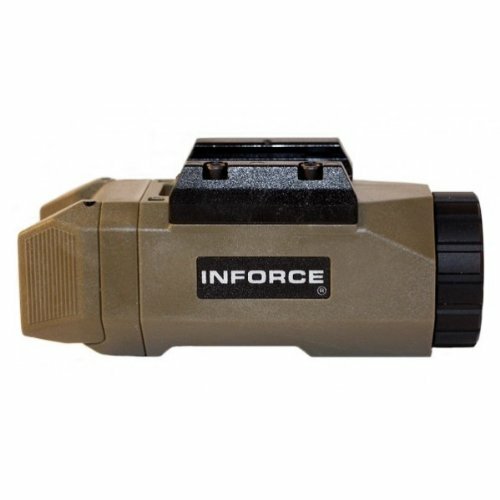 The InForce White LED is a nicely balanced 200 lumen light that isn’t as bright as it maybe should be to add some tactical advantage by blinding most targets, but it does help you to attenuate to the surrounding light output in smaller spaces more readily. This brand is up and coming and offers good quality feature sets for decent price points. Runs for 1.5 hours on a CR123 and is relatively lightweight creating a good balance on the gun. WHY IT IS RECOMMENDED: Great customer reviews and attentive customer service helping to fix a bad batch of frame mounting hardware means this company has done what most companies wish they could: rebound from a potentially devastating mistake by offering better customer service and fast response to unexpected issues. 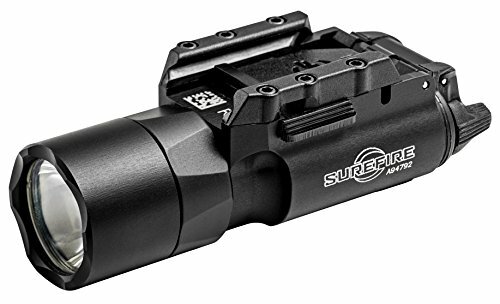 Long the standard bearer for the tactical pistol mounted flashlight world, the SureFire brand and product offering hasn’t skipped a beat in offering a best in class light and longevity that most companies are envious of. The 500 lumens are a good mix of blinding power, and high suitability for enclosed spaces so as not to blind the user of the weapon. WHY IT IS RECOMMENDED: Not that you’ll need it, but it has a limited lifetime warranty. 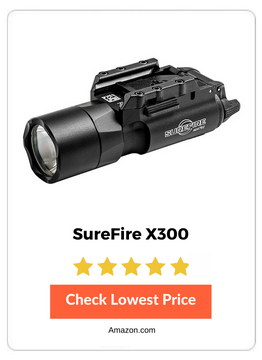 SureFire generally is so good in this realm, though, that it’s usually a moot point to have a warranty. The bright 500 lumen light and the good run time for the output (1.5 hours at peak). 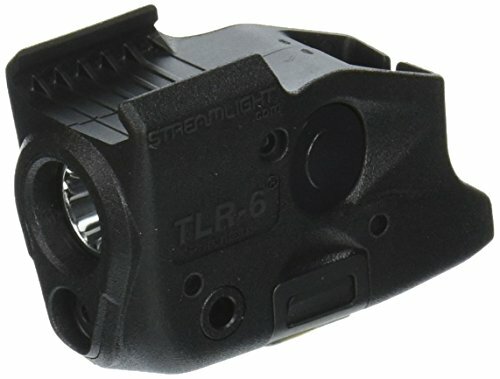 The Streamlight 69420 Tlr-7 is a very nicely made, fairly universal pistol light that offers a high lumen count and a 1.5 hour runtime on peak. The quality of construction means this is a strong contender for those who are tough on their firearms. WHY IT IS RECOMMENDED: It’s hard to knock anything about this Streamlight product. The high lumen count and the great build quality make it a very nice choice. Now you know enough about the best pistol lights to make an informed decision. More importantly, you know how to avoid a seriously disadvantaged position if you are ever required to furnish your personal protection firearm in a life or death situation. 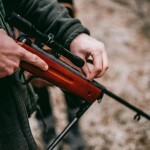 Having the ability to see a clear picture of what is before you and identify and act on threats properly as well as potentially disorienting those threats can be the difference between a lawsuit for shooting the wrong person and responding to improve your immediate safety against a legitimate threat. A simple, inexpensive (yes, we admit, not all of them on this list are “inexpensive”) handgun light can make all the difference in the world. Not to mention: there has never been a recorded instance in history where a defensive shooter admitted to “being glad they didn’t know if the thing they thought was a threat, was actually their child or spouse”. A pistol light can help you know what or who you are aiming at and if they are in fact, a threat. This is especially true when things go bump in the night and you need to know if it’s Tabby the cat from next door, or the well-armed drug addict looking to score a stolen piece of your property. Things can escalate quickly, make sure you can act properly and speedily – use a tactical pistol light. Clearly identifying threats can be the difference between a lawsuit for shooting the wrong person and responding to improve your immediate safety against a legitimate threat. The products reviewed are all high quality so be sure to read through the reviews and find the right product for your needs. Benjamin Worthen is a former Gunsmith of more than 20 years. He now works as a writer in the firearms industry and as a marketing consultant for several industries including the Political and Firearms arenas. He has worked in consulting capacities and as a contract vendor for the military and law enforcement agencies and as a firearms designer and engineer for proof of concept pieces and custom firearms. He is a vocal supporter of Second Amendment rights.